I’m always looking for the irretrievable moment where you’re committed to the action but the action hasn’t actually happened yet. This is evident in his paintings. A Japanese bride is on her way to get married less than a minute after the first atomic bomb is dropped. A contrail is faintly visible in the sky overhead. Other paintings envision a peaceful evening sunset before a meteor streaks across the sky. Locals enjoy their drinks in a White Rock Starbucks as the blue and red lights of a patrol car are reflected in the window, and you know something’s about to change. You can see images here. After Adams mentioned this phrase to me that’s also the title of his art show, I’ve been noticing numerous irretrievable moments crop up in my reading. As you will probably not remember at this time last year, I was reading Crime and Punishment for GRNM (Giant Russian Novel Month). This year, a friend and I are tackling Tolstoy’s War and Peace. We are not going to be finished in a month. He recalled her former words and looks, and the words and looks of those who had seen them together. He recalled the words and looks of Anna Pavlovna when she spoke to him about his house, recalled hundreds of similar hints from Prince Vassily and others, and terror came over him at the thought that he might already have bound himself in some way to go through with something which was obviously not good and which he ought not to do. But while he expressed this realization to himself, on the other side of his soul her image floated up in all its feminine beauty. Pierre knew that everyone was only waiting for him finally to say one word, to cross a certain line, and he knew that sooner or later he would cross it; but some incomprehensible terror seized him at the mere thought of that frightful step. It was becoming frightening. It was obvious that the affair [referring to the duel], having begun so lightly, could no longer be prevented by anything, that it was going on by itself, independently of men’s will, and would be accomplished. There is definitely a fatalistic streak in Pierre’s thinking. I also notice it in Rostov and Prince Andrei but, interestingly, not so much in the female characters. While I understand this feeling of “how way leads on to way” to borrow from Robert Frost, I think we tend to stick that irretrievable label onto our own lives more quickly than onto others’ lives. We are so entangled in our own that we sometimes can’t see there actually are other paths, other “roads not taken.” Sometimes I get the sense with these Russian characters that there’s even a Romanticism to fatalism, as if accepting the inevitable is heroic and must be so. But it’s so obvious as a reader that it’s not necessarily so. I’m coming to a part in the novel now where the main characters are waking up from the false slumber of the inevitable, realizing that things can and should be otherwise, and perhaps it’s not too late . . . I was reading E.M. Forster’s novel Howards End when the Graeme Patterson exhibit Secret Citadel opened at the Surrey Art Gallery. I never thought these cultural artifacts would have anything in common—a classic book written about turn-of-the-century English society and a sculptural installation containing detailed miniature scenes by a contemporary Canadian artist. But, in an odd way, they did. They both talked about the end of friendship. I was at the artist’s tour of Secret Citadel as Patterson led the crowd around his chronological work that starts with complex miniature versions of his and his childhood friend Yuki’s homes in Saskatchewan. Then Patterson walked us over to two life-sized bunk beds called “Camp Wakonda.” Two boys play archery on the top level. On the bottom, a car crashes with a school bus and erupts in flames. “Camp Wakonda”. Installation image at Art Gallery of Hamilton. Photo by Mike Lalich. Turns out Secret Citadel is all about Patterson’s friendships—not just with Yuki, but all his male friends at some point in his thirty-something life. That’s why he puts animal heads (a cougar and a bison) onto two human figures as a broader form of representation. You see these masked characters jumping on a trampoline as children, wrestling each other in adolescence, and drinking in bars alone as adults. It got me thinking about the unfortunate ways that friendships die. In Howards End, two close sisters with liberal values, Margaret and Helen, become torn apart when Margaret gets engaged to Mr. Wilcox, a rich older widower who represents a system and values so different from their own—capitalist, rational, unfeeling. While there are multiple tragedies in the novel, the dissolution of the sisters’ friendship was the sharpest to me. Helen cannot like Mr. Wilcox and tells Margaret so. She dislikes him even more when she finds out he had a mistress in his first marriage. This mistress is now the wife of Helen and Margaret’s friend Leonard, who is impoverished due to some ill-timed business advice that Mr. Wilcox gave him. After hearing the scandalous news, Margaret resolves to forgive her fiancé and stay with him. 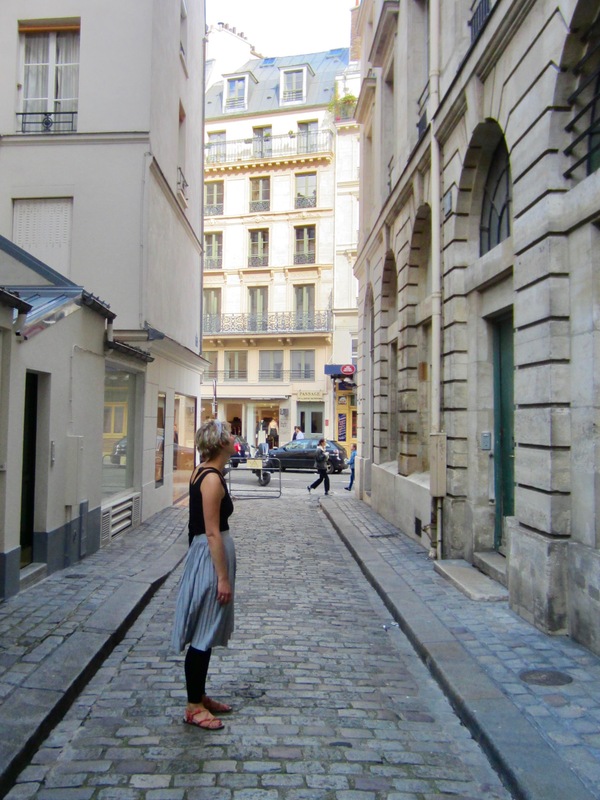 Helen, however, runs away to Germany and avoids Margaret, barely replying to her letters. “Player Piano Waltz”. Installation image at Art Gallery of Hamilton. Photo by Mike Lalich. It was at this point in the novel where I really started to care about the characters. The sisterly affection that seemed so cemented began to crack. They became the estranged friends in Patterson’s final sculpture, “Player Piano Waltz,” shown in separate window frames drinking in a bar alone and riding an elevator up and down from their bachelor apartments as a haunting melody plays on the keys below. “Player Piano Waltz” (detail) via NGC Magazine. All of us can relate to these characters even though Patterson is speaking from his own experience. Friends we once cared for are now close only in memory (or via Facebook status updates). Maybe the relationship ended over a specific disaster or it was subject to the drifting tides of time, place, and circumstances. Both are sad. But since the latter is an inevitable part of growing up, the former feels especially tragic—when two people don’t have a “natural” reason to be friends anymore. Refreshingly, Forster takes a similarly tragic situation threatening two sisters’ friendship and offers us a different resolution. The picture closing Howards End is one of unexpected community. Two fragmented houses are reconciled under one roof thanks to Margaret and her ability to bridge the softened Mr. Wilcox with the pregnant Helen who ran away because she was carrying Leonard’s baby. Forster’s novel shows a believable and beautiful example of what can happen when there is a willingness to connect. Margaret’s language implies we are fully human when we do this—when we choose to connect our lives with others by loving, forgiving, and showing grace, even to those who see things so differently from us. When we love, we’re building a bridge towards wholeness, offering a picture of the world as it could be. It made me wonder what the narrative arc of Patterson’s tale would be had his friend forgiven him for the car crash. Certainly there would still be bittersweet moments, but maybe a friendship wouldn’t have been relegated to the secret citadel of memory. Maybe the cougar and the bison would take off their grudges, resentments, and hurts they wear like masks, step across the room, and drink a pint together. Graeme Patterson: Secret Citadel runs until March 20 at the Surrey Art Gallery. Hi everyone, just wanted to say a (very) belated Happy New Years! With my engagement and then Christmas and then the beginning of wedding planning, let’s just say things have been more than a little crazy. Unfortunately this blog has been a little dormant as a result. But hopefully for not much longer! Low Clouds by Nicoletta Baumeister. Tis the season for a lot of new art exhibits. 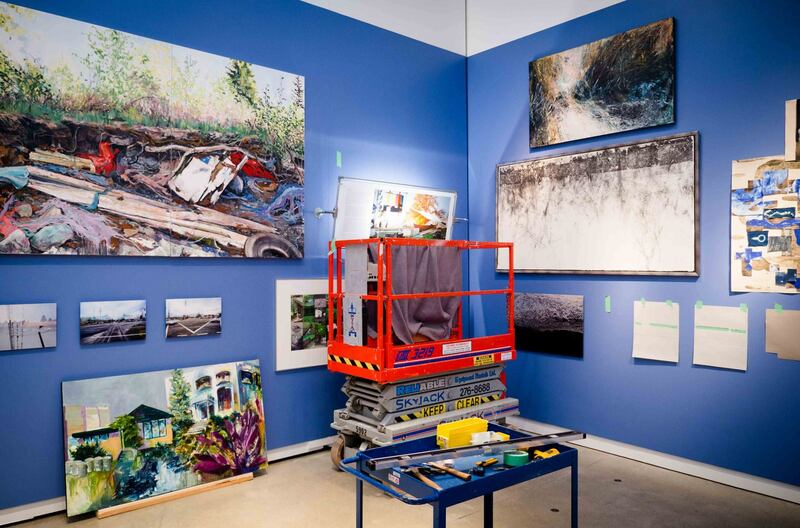 Since I now work at the Surrey Art Gallery and our big opening reception for 3 exhibits is tonight, I thought I’d say a little about it and plug it for all you last-minute planners who may even want to check it out! Installation of Micah Lexier’s A Project for Surrey. Photo by the artist. 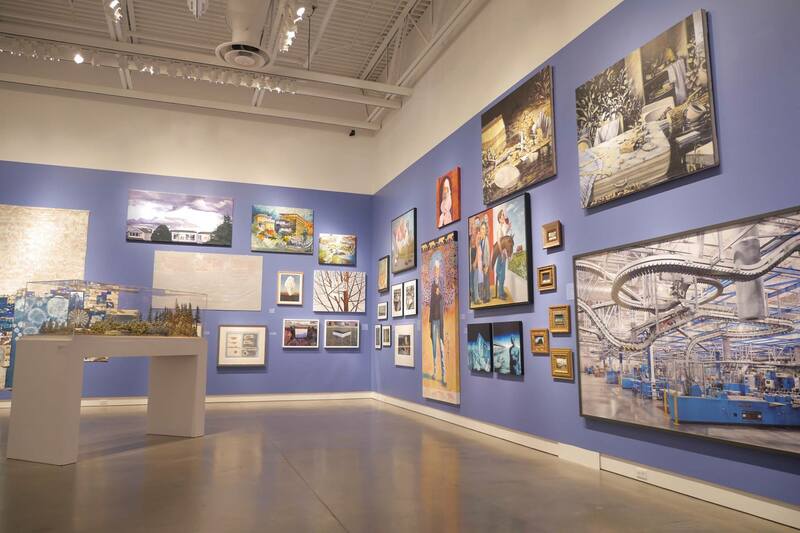 It’s the Gallery’s 40th anniversary this year, and in celebration of that, the curator has chosen exhibits that focus on Surrey and its surrounding area. 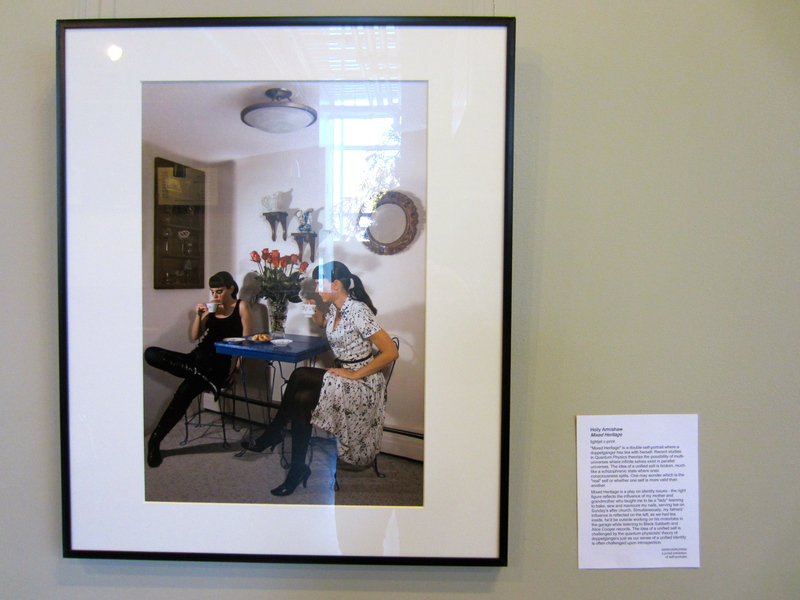 Vancouver art gets a lot of attention as the new Mainstreeters: Taking Advantage, 1972-1982 exhibit that just launched at the Satellite Gallery indicates, but art from/about the suburbs isn’t always so hot. But that doesn’t mean it shouldn’t be! 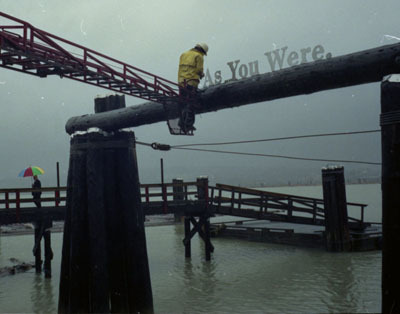 25 artists from across Surrey, Langley, Delta, and Vancouver are represented in Views from the Southbank I: Histories, Memories, Myths – the first of a series of 3 installations that will run throughout the year. Surrey has the reputation of being a very young & rapidly-growing city with tons of new development, especially in the City Centre, but that doesn’t mean it doesn’t have deep history. Payal 128th by Ravi Gill. 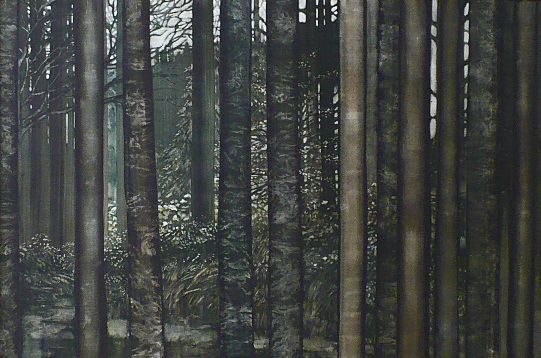 Sean Alward, Nicoletta Baumeister, and Polly Gibbons are a few of the artists who explore the deep roots of place, and the connections with memory, perception, and identity – collective and individual. 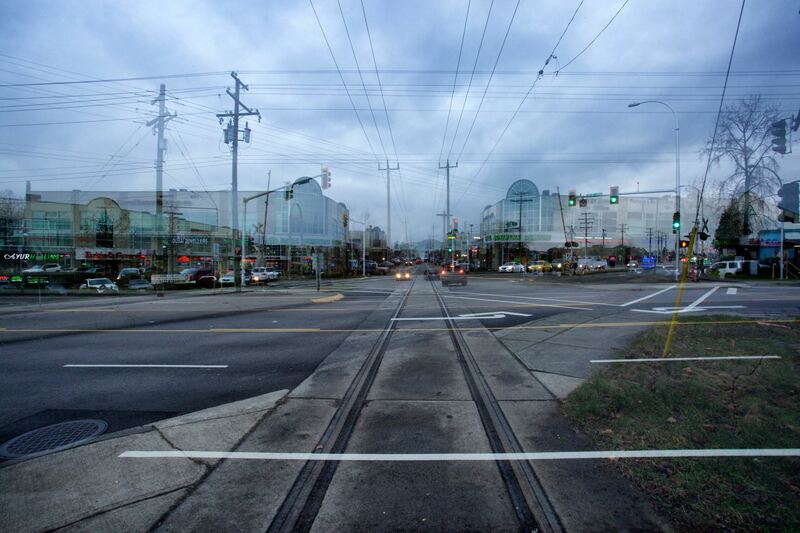 Surrey Urban Sprawl by Roxanne Charles. 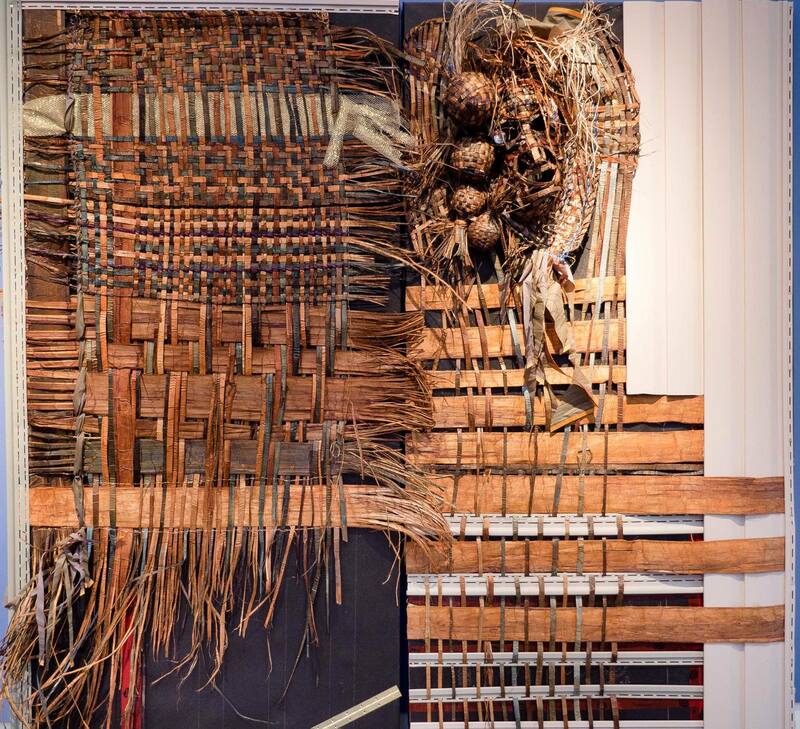 There is an astonishing variety of art mediums packed in to the Gallery’s space, from Roxanne Charles’ new monumental wall relief “Surrey Urban Sprawl” that weaves together cedar bark, construction tape, copper, brass, wire, polyethylene, vinyl siding, nylon, and synthetic fiber to Brian Howell’s large photograph of a conveyor system at the Kennedy Heights Printing Plant in Surrey (now shut down) where the Vancouver Sun and the Province used to publish their newspapers. And then there are large paintings by White Rock artist Jim Adams in the manner of Edward Hopper, featuring dramatic lighting, stormy skies, and a look into neighbours’ lives through their windows that reminded me of a scene in The Great Gatsby. Here are some before & after shots. As you can see, there is literally art everywhere, from floor to ceiling! 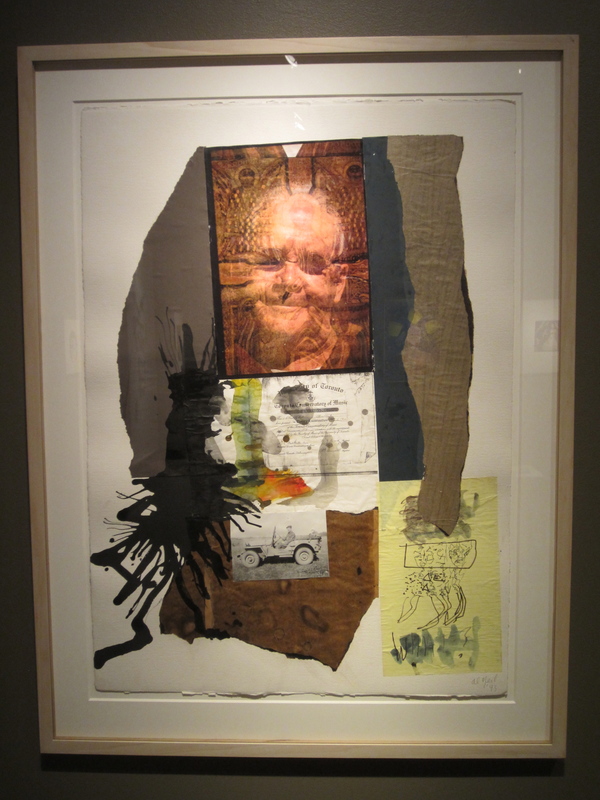 The opening reception goes from 7:30-9:30 pm on Saturday, Jan 17 with formal remarks at 7:45 pm. If you’re not able to make it out tonight, it runs until mid-March so make sure you see it before it comes down! None of these writing prompts prompt me lately. I don’t want to write about an onion, how I fight life, or what I would have said if I had landed first on the moon. I want to write about the little boy in the art class I help teach who makes up the craziest interpretations of his work and reminds me what it’s like to be young and wonder-full. There are ninjas and dragons and oceans and astronauts where I see only splotches of blue and splatters of red. When he’s explaining it to me, I start to see his world. I start to love his world. I never liked jazz music because jazz music doesn’t resolve. But I was outside the Bagdad Theater in Portland one night when I saw a man playing the saxophone. I stood there for fifteen minutes, and he never opened his eyes. After that I liked jazz music. Sometimes you have to watch somebody love something before you can love it yourself. It is as if they are showing you the way. The five-year old boy I see once a week at the Surrey Art Gallery is the musician never opening his eyes. He gets immersed so easily, even if it’s not in the ‘sanctioned’ activity. He’d rather bob his sponge up and down in a container of water with the end of his brush than load it with paint and put it on canvas because he is, after all, a boy, and boys like to play. “Take a look at this,” he calls me over in a eureka!-type voice. “The sponge is so heavy with water, but it still floats! This is amazing!” And I guess it is. Forget the paintbrushes and paint. Equipped with sponge and water, he is mesmerized the rest of the class. The kids are painting self-portraits. Bright colours, Matisse style. Fauvism. Or Andy Warhol’s pop art. Portrait of Madame Matisse (The Green Stripe) by Henri Matisse. 1905. Portrait of L. N. Delekorskaya by Henri Matisse. 1947. Silkscreen prints of Marilyn Monroe by Andy Warhol. 1960s. Or at least they’re supposed to paint bright colours. Green, orange, red, blue, yellow. They get a bit of white for lightening purposes, and black, to outline their features. “There’s something wrong with these paintbrushes!” the boy quickly remarks in an alarming tone, beginning to outline the edges of his face. “What’s wrong with them?” I ask. “They look thin but they act fat!” He lets out the groan of an artist not happy with his work. I laugh. Appearances can be deceiving, whether you’re five or forty-five. Looking at the canvasses in the room, I don’t see many bright colours. Kids are so creative and yet when encouraged to be creative, they blend the colours like crazy until they find the most realistic skin tone. Maybe you have to be old to be avant-garde. No, that’s not true. They were old enough to be frustrated. “I’m beginning to regret something about my painting,” the same boy says with a deep sigh. I didn’t know a five-year old knew regret, let alone could use it in a sentence. “What do you regret?” I ask, curious what’s on the other end of that line in a five-year old’s mind. It did show up. White as snow. This is the boy who stuck eight layers of glaze on his clay cupcake the week before to make sure it would come out of the kiln completely covered. It came out covered all right. More like caked. Sometimes kids do things too completely. Lost in art, they don’t know when to stop. Of all the problems to have, I think this is a pretty good one. The saxophone player never opening his eyes, feeling his way through the music. A good kind of lost. I visited the Surrey Art Gallery today. The current exhibitions there centre around the self. What does it mean to portray yourself in a self-portrait? How do we choose to represent ourselves? What is self? Big questions for a Friday morning. Artist Holly Armishaw portrayed herself taking her doppelganger (double) for tea. This photograph depicts the multiple identities that comprise each of us. The right figure reflects her mother’s influence on her life (how to be a lady, serving tea, sitting pretty) — and the left figure reflects her father’s influence (working on his motorbike in the garage listening to Black Sabbath and Alice Cooper records). 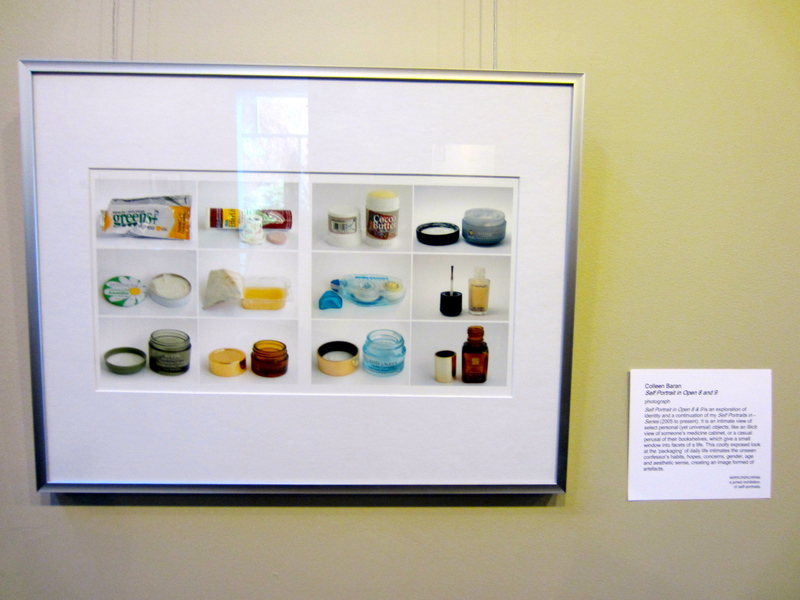 This next image by Colleen Baran plays with the idea that we can get a cursory yet often accurate glimpse of someone’s identity by the things in one’s purse, in one’s medicine cabinet, the books on one’s shelf, a DVD collection, the art in one’s home. I think this is why I’ve always found it so fascinating to housesit. The things people own tell a lot about who they are, their aesthetic tastes, their loves and fears, the way they spend their time. But we are also more complex than what these objects speak about us. We can’t be reduced to what we own. 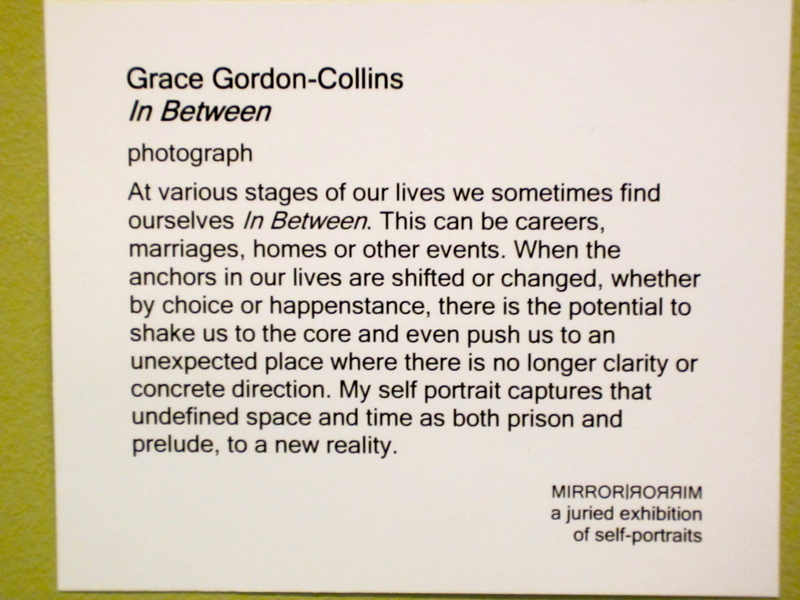 This next one by Grace Gordon-Collins, I like the description better than the portrait. She’s unstable and evanescent, and it probably reminds me too much of my own in-betweenness. Undefined space and time as both prison and prelude to a new reality. Could she have said it any better? 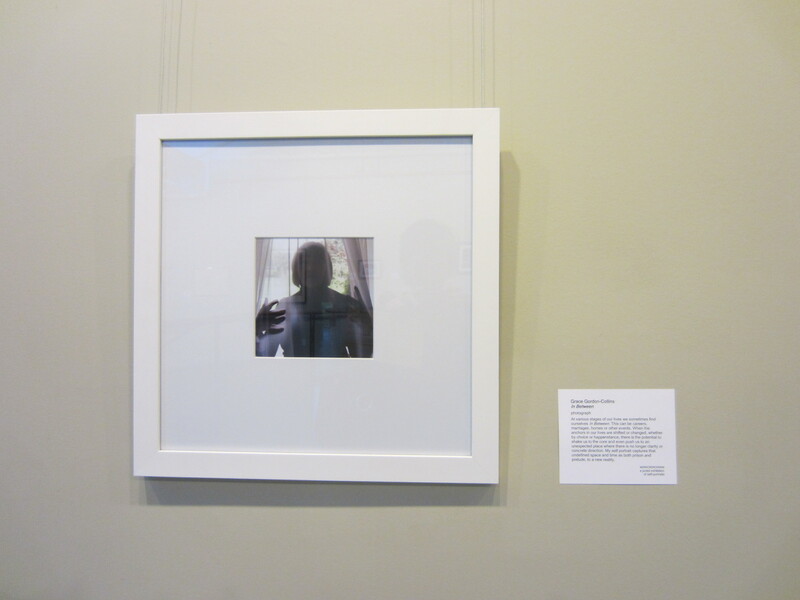 If you were submitting a self-portrait in this exhibition, how would you portray yourself? What defines you? This collage of personal documents and photographs by Al Neil reminds the viewer of the limits of such a question, for we are different people at different times in our lives. Or maybe not different people, but different versions of ourselves. How do you capture all these facets? Do you even try? Under this mask, another mask.